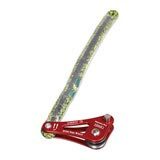 The Rope Wrench is a friction device that allows the climber to ascend, descend and work the tree with SRT "Single Rope" with a friction hitch. It is not intended for use as primary life support. The wrench has undergone an The Rope Wrench is a friction device that allows the climber to ascend, descend and work the tree with SRT "Single Rope" with a friction hitch. It is not intended for use as primary life support. The wrench has undergone an impressive design evolution since it first appeared in wooden form. This newest version boasts a sleeker design with rounded aluminum sideplates allowing for less potential for damage to the climber's line and the set screw on the back pin allows for quick changeover between desired tethers. Included quick release pin for mid-line attachment. The Rope Wrench can be purchased with the shown stiff tether or just the wrench alone. This tool is a simple yet effective tool that assists a climber climbing up and down in Single Rope Technique (SRT). The Rope Wrench works by using leverage to force the rope into an S shape and providing friction for a controlled descent. When engaged, the Rope Wrench acts much like a conventional descent device such as a Figure eight. When not engaged, the Rope Wrench provides no interference with ascending the rope. This allows the climber to work an entire tree using Single Rope Technique. The Wrench Advantage: Using a Rope Wrench has advantages over many other SRT systems as well. Climbing with mechanical ascenders allows one to rapidly ascend the rope but the climber must perform a changeover to descend. 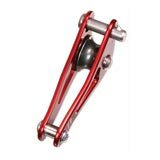 The Rope Wrench dissipates friction and heat away from the climbers friction hitch allowing the climber to descend. The Rope Wrench is essentially a descent device that has a neutral gear that allows it to ascend the rope as well. Because of this neutral gear, it is imperative that the Rope Wrench be used with a sturdy and trusted friction hitch.